The Cheetham Saltworks, Moolap, is an extensive industrial site, spread over an area of approximately 500 hectares. 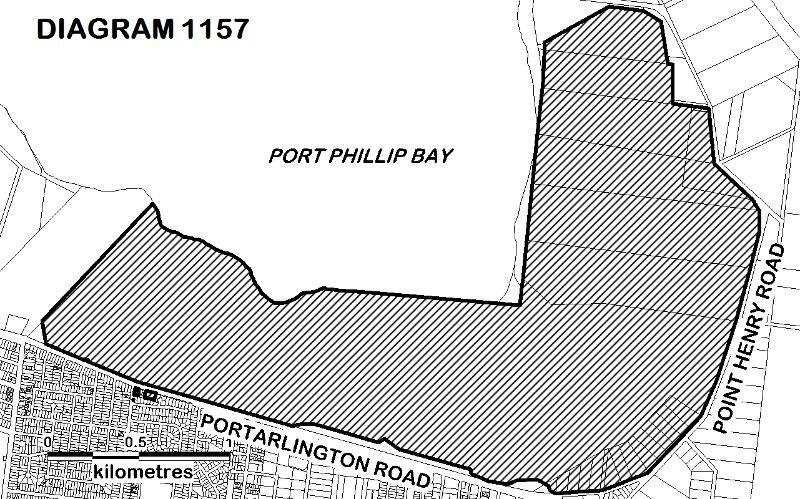 It consists of a series of evaporation and crystalliser pans, an extensive basalt sea-wall and a memorial hall/library building and former manager's residence, both of which are located on allotments south of Portarlington Road. The site also includes administration and workshop structures and associated land, located north of Portarlington Road; however none of the existing buildings are original and largely date from the mid to late 20th century. Richard Cheetham, a manufacturing chemist, arrived in Australia in 1862, with some knowledge of the salt gathering industry in Southern Europe, and made initial attempts at evaporative salt production on French Island in the early 1870s. He realised the potential for producing salt on large flat areas of the Victorian coastline, using solar evaporation of seawater, and in 1888 leased 650 acres (263 hectares) of land on Port Phillip, east of Geelong and constructed a saltworks which was largely modelled on examples in the south of France. His initial 21 year lease at Geelong from the government was extended to 99 years in 1892, and the company became known as 'Richard Cheetham and Company, Victoria Salines'. Retired bank manager, Alexander W Cunningham, joined the company as a partner in 1890 and provided financial backing. His son Andrew assumed the position of managing director of the company after Cheetham's death in 1900 and a second son Alexander assumed this position in 1921. A house was erected for the manager c1890s on land adjacent to the Saltworks. 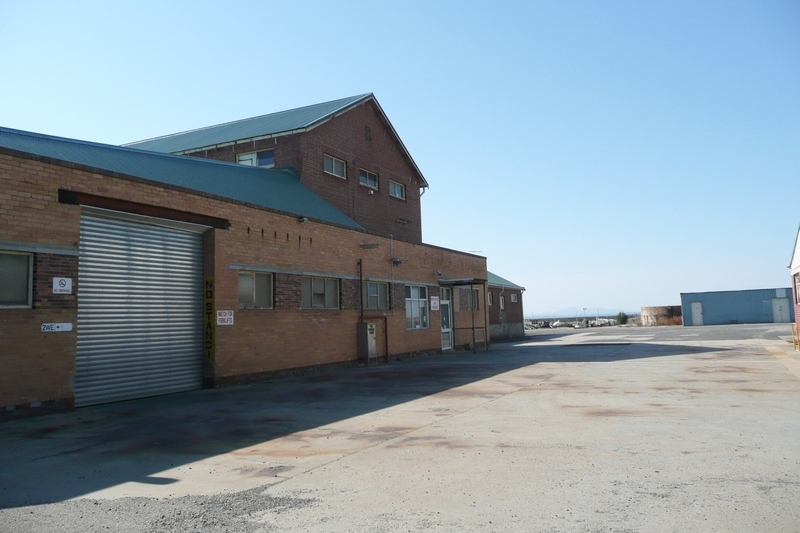 The company, known as Cheetham Salt Pty Ltd from the early 20th century, employed large numbers of local workers, and a building was constructed adjacent to the house in the 1920s as a recreational hall and library for employees. Cheetham Salt Pty Ltd built a second saltworks in Laverton in 1924 and a third at Avalon in 1951. 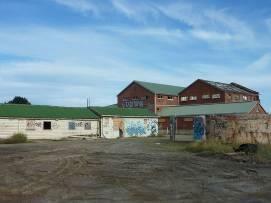 The Moolap Saltworks closed for a period in the 1990s and then ceased operation in 2009. The majority of the Cheetham Saltworks site consists of an interconnected series of evaporation and crystalliser pans, delineated by low earthen walls shored by timber planking. An extensive basalt sea-wall remains which provided a controlled inflow and outflow of salt water via a sluice system and operated in tandem with a series of pumps located throughout the fields. Various items of equipment, generally dating from the later 20th century period, remain at the site. 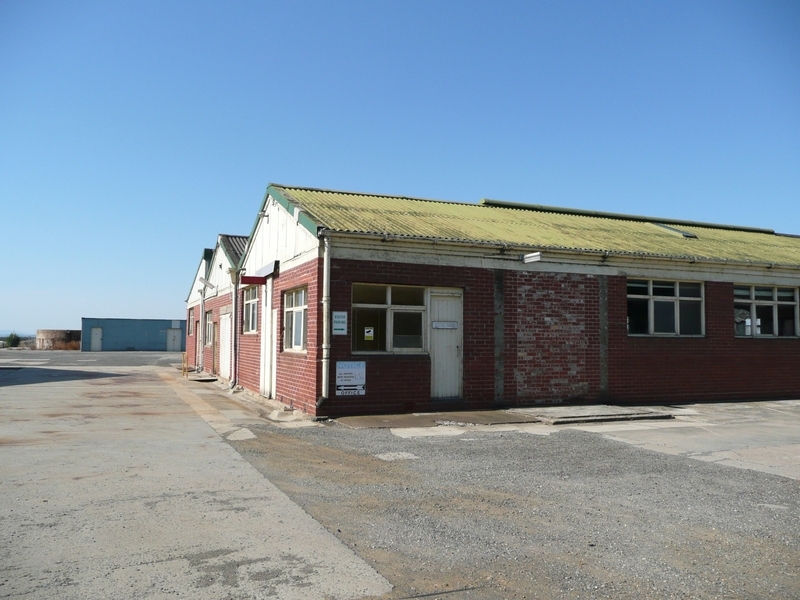 The administration and workshop area, located on the north side of Portarlington Road, consists of a group of corrugated iron, timber and red brick structures, which generally date from the mid to late 20th century. 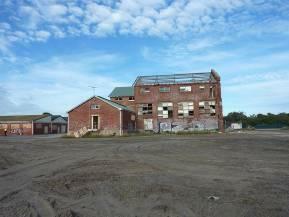 None of the original buildings have been retained and very little of the buildings erected prior to 1940 remain. Immediately to the south are two associated buildings: the former manager's residence and the Cunningham Memorial Hall and Library. 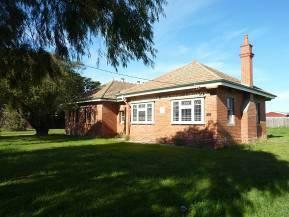 The former is a single fronted timber weatherboard Late Victorian styled house, and the latter a two wing red brick building, dedicated to two members of the Cunningham family killed in World War I. This site is part of the traditional land of the Wathaurung. Criterion F Importance in demonstrating a high degree of creative or technical achievement at a particular period. As Executive Director for the purpose of the Heritage Act 1995, I give notice under section 46 that the Victorian Heritage Register is amended by amending Heritage Register Number H1157 in the categories described as Heritage Place and Archaeological Place. All of the place shown hatched on Diagram 1157 encompassing all of Lot 2 on Plan of Subdivision 507775, all of Lot 10 on Plan of Subdivision 507783, part of Lot 1 on Title Plan 849593, part of Lot 1 on Title Plan 850467, all of Lots 1 to 13 and part of Lot 14 on Title Plan 874787, all of Crown Allotments 18, 18B, 19, 19B, 21, 24, 2009 and part of Crown Allotment 2011 Parish of Moolap. The ancient manufacturing process of salt making is still undertaken in many third world countries in its most primitive form. Raw salt crystals are gathered from natural salt pans or rock salt mined from geological deposits and then the crystals are hand ground. The elaboration of this involves the construction of artificial evaporation basins and the manipulation of the flow of brine or the employment of an alternative artificial means of evaporation. More sophisticated processes have been developed to refine the salt, with the washing out of impurities and the re-crystallisation of the salt. Deliberate salt use and salt manufacture appear to have been entirely imported activities in Australia. It was an essential part of the European diet, an important preservative for perishable items, and an ingredient in a variety of industrial processes such as soap making. With no rock salt deposits in Australia, all salt produced in this country has always been by evaporation of sea water or salt lakes. Sea water was the principle source of salt production in Australia prior to the 1890s. Salt making technologies used in Australia prior to 1900 derived mainly from British sources, but the application of the technologies produced a number of adaptations. Early Australian salt producer, Richard Cheetham, employed the solar evaporation process, which required a large flat area next to the sea. 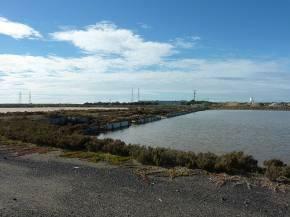 Sea water was collected from Port Phillip for eight months of the year and the water was fed into a series of shallow evaporative ponds. 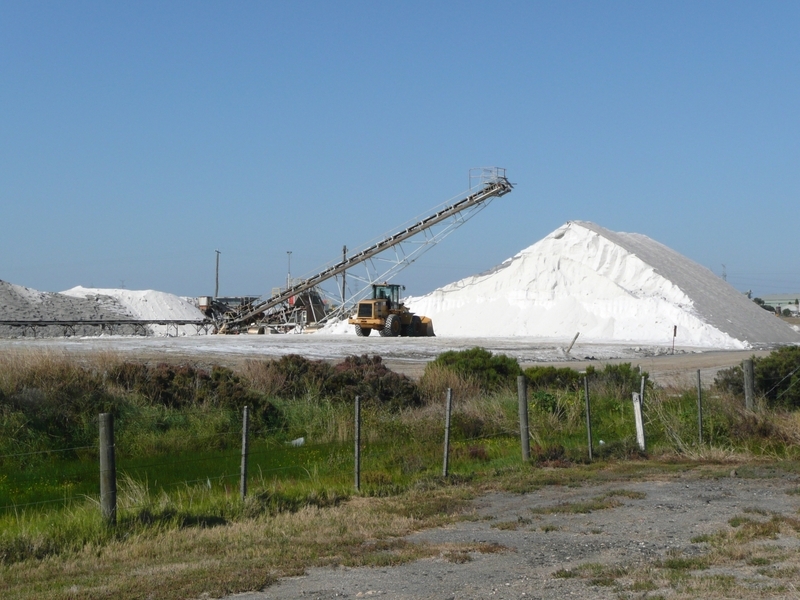 The salt manufacturing process involves three basic procedures: evaporation, harvesting and refining. The evaporation process involves trapping sea water in a system of evaporation fields or pans, with the water passing through a series of gate-regulated movements to increase the concentration of salts. The final saturated solution of salts, known as maiden brine, is pumped into crystallising pans which are walled with timber (used for its resistance to salt damage) and have a perfectly flat, level compacted floor of washed sand. Any liquid that remains is pumped off and returned to the sea. The harvesting process occurs after a 5-10cm crust of salt has been deposited each season in the crystallising pans. The salt was originally harvested by hand, however this process was eventually undertaken using a specially adapted tracked vehicle, similar to a wheat harvester. The salt was loaded onto tramway trucks and hauled to a 'tumbler' near the refinery where trucks were inverted and the salt transferred to a large stack of up to 30,000 tons. This was then left to drain. At Cheetham Salt Ltd, Moolap, salt was harvested once a year. During the refining process, raw salt crystals are crushed and washed in concentrated brine solution to remove impurities. The salt is then screened, re-washed and redried in a centrifuge, before being transferred to an oil fired kiln for final drying at a temperature which also kills any remaining organisms. The salt is crushed again and sieved to 5 or 6 different grades, then bagged and stacked for dispatching. Although the process has become more mechanised over time, the actual method of working the sea and collecting salt remains unchanged. Richard Cheetham was born in Manchester, England in c1836 and became a manufacturing chemist with some interest in the salt gathering industry in Southern Europe, particularly in the south of France. He migrated to Australia in 1862 for health reasons and reportedly established a soap works in Orrong Road, Prahran and manufactured the first sodium carbonate in Australia. He saw the possibility of establishing a salt industry on the Victorian coast and, in partnership with others, set up his first works for this purpose at French Island. 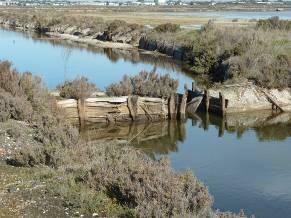 Early attempts at salt manufacture in Victoria occurred at Bass River (1848) and Crib Point (1868-72). Melbourne engineer James Hart selected a 129 hectare allotment on the south-east coast of French Island to establish a saltworks in 1872 and the following year he formed the French Island Salt Company with wholesale druggist, Edward Keogh, acquiring the adjoining 20 hectares of land that year. 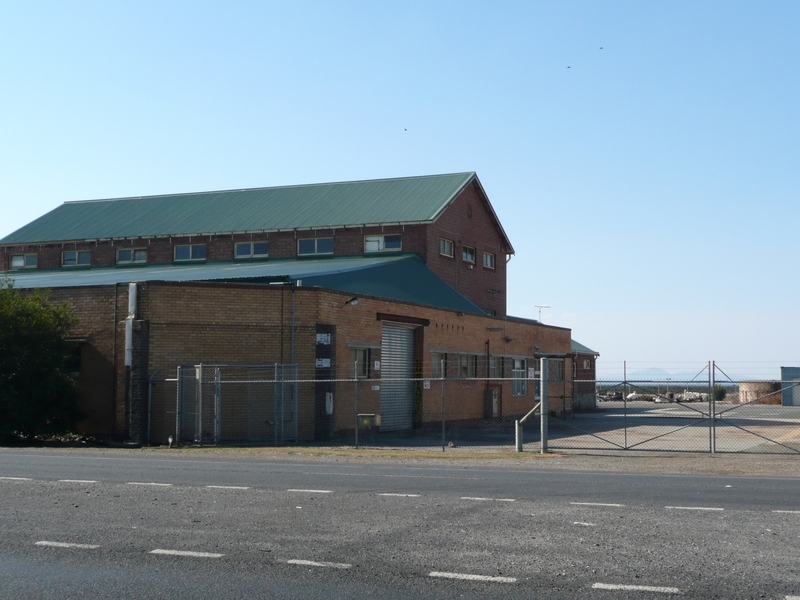 Richard Cheetham acquired the land in 1874 and named the saltworks St Helen's. These appear to have operated intermittently until 1887 when equipment was relocated to the Marshes saltworks at the north of the island. Cheetham acquired a three year lease of 1214 hectares (3000 acres) of land on the north coast of French Island in 1881 and, in need of capital, established the Australian Salt Manufacturing Company in partnership with Felton & Grimwade, Alfred Shaw & Co and Hughes and Harvey. Cheetham travelled to England and Europe to inspect saltworks in the early 1880s but in 1885 he was forced to leave the company. On his death in 1900 Cheetham's last will and testament listed his former address as St Helen's, French Island and his wife's last will and testament in 1915 listed ownership of 19 acres of vacant and unoccupied land at French Island. Cheetham went on to establish the first successful commercial solar saltworks in Australia. 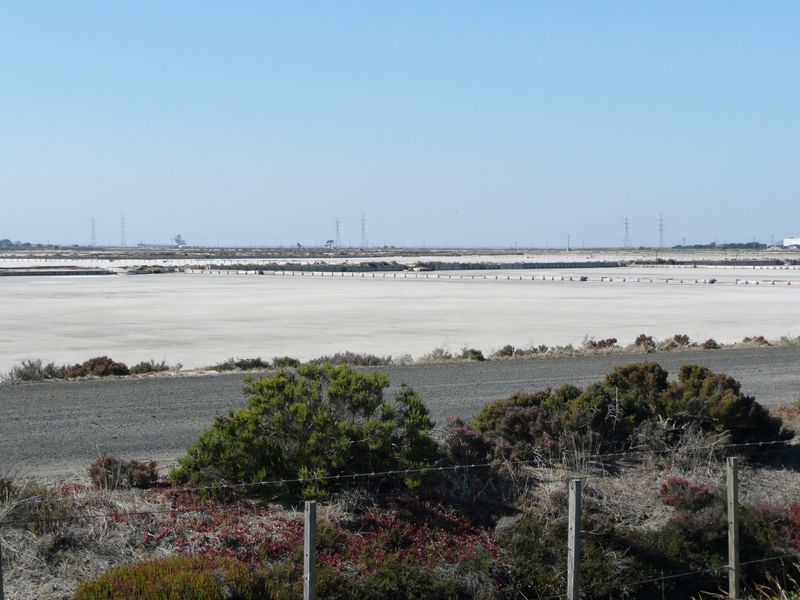 In 1888 he began construction of a salt production works on 650 acres of foreshore at Stingaray (now Stingaree) Bay, on Port Phillip, about four kilometres east of Geelong. This low-lying scrubland between Limeburner's Point and Point Henry was obtained from the Victorian Government under a 21 year lease. 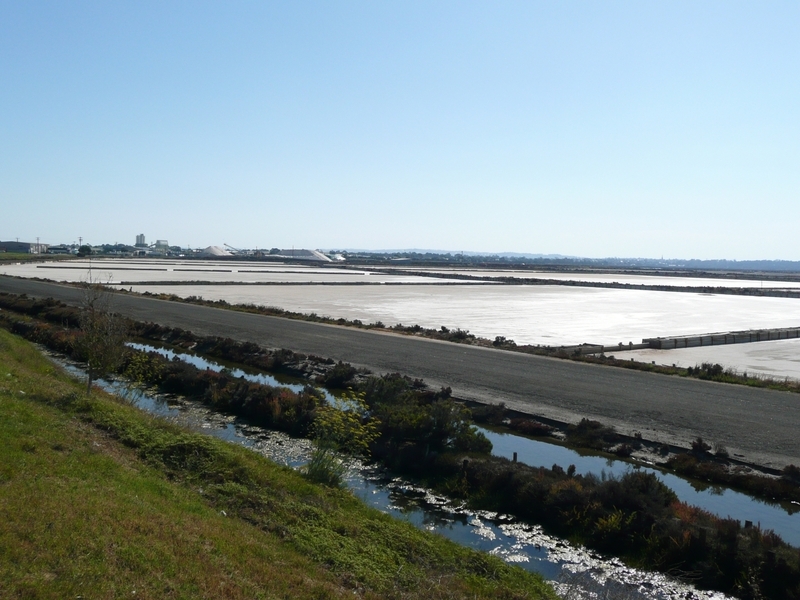 The saltworks were modelled largely on saltworks in the south of France which consisted of a series of shallow ponds through which sea water passed. Despite Cheetham and his associates having no detailed knowledge of engineering or surveying instruments, a mile-long coffer dam, a basalt sea wall, was constructed across the bay and a series of wooden lined channels were constructed which had an even fall of only one inch over a half mile. Sluice gates to control the flow of water were designed so that the evaporation pans were filled by the incoming tide and salt water trapped on the ebb tide. Gravitation was used where possible but a steam-powered centrifugal pump was also installed. When the brine reached the final compartments, it was almost saturated, and on further evaporation salt crystals were deposited and a bed 5-10cm thick was formed. Salt was harvested by lifting with shovels and gathering into heaps, and leaving to drain for a few days before its removal to larger heaps where it was left to drain for at least a year. By November 1891 (Argus, 9 November 1891) some form of refinery had been erected to remove impurities and to produce a pure, fine grained salt for domestic and dairy purposes. This was reportedly based on British technologies. Cheetham's initial outlay to transform the land at Moolap for the purpose of producing salt was nearly £16,000. In the first three years, the works produced 500 tons of salt. This was followed by 2000 tons in 1893 and 6000 to 8000 tons were expected to be produced in the next season (Argus 21 March 1894). Before committing to expending further capital, Cheetham requested to purchase his leased land from the Government, resulting in the 1892 Moolap Land Sale Act being placed before parliament. This Act was defeated as the sale of freehold land around the foreshore was not approved. Cheetham however managed to extend his existing lease from the original 21 years to 99 years. At this time the company was known as 'Richard Cheetham and Company, Victoria Salines'. Financial backing for the company was provided by Alexander William Cunningham, retired Assistant Chief Manager of the National Bank of Australasia Ltd, who joined as a partner in 1890. Cheetham was managing director of Richard Cheetham & Co Pty Ltd from 1894 until 1897, and Cunningham's son, Andrew Hassell Cunningham, assumed this position in 1900 after Cheetham's death that year. The company became Cheetham Salt Pty Ltd in c1903. A second son, Alexander Jackson Cunningham, assumed the role of managing director after Andrew's death in 1921. A house was constructed adjacent to the saltworks site in the 1890s, to house the director of the company. The refinery was expensive to operate as it used large quantities of coal and was labour intensive, so it was replaced in 1897 by a grindery which was built on the Point Henry Road to refine the salt. As the Cheetham products became better known they displaced imported brands of salt. This led to an increase in the size of the crystalliser ponds, buildings and machinery at the refinery. Horse drawn drays were originally used to transport salt from the crystallising pans to the refinery and from the works to the customer. Horse and hand-worked tramways were introduced around the turn of the century and not long after, the system was operated by locomotive haulage. In 1910 the tramway system was extended to run from the grindery to connect with stores and a siding on the Geelong-Queenscliff line to facilitate the dispatch of bagged salt. A special freight rate was granted by the rail commission for the carriage of salt to Melbourne. A new refinery was erected in 1918 and this was opened by the Premier of Victoria, Sir Harry Lawson. Electric power was introduced and the installation of a portable elevator for the salt stacking process saw a greater mechanisation of the salt handling process. 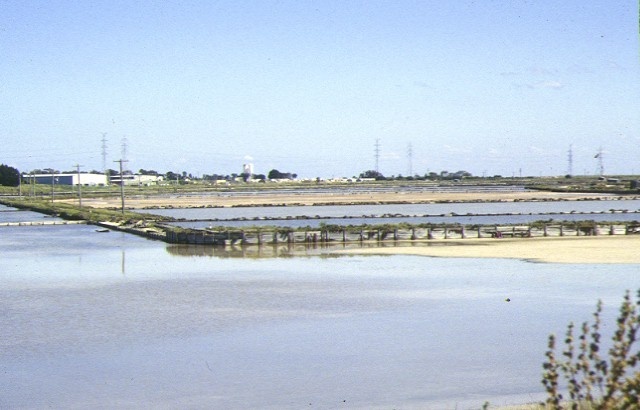 In 1924 Cheetham opened a second saltworks at Laverton, with the first harvest occurring in February 1926. During the period 1936 to 1940 a number of buildings were constructed including a large workshop with plant. A press for the manufacture of salt blocks and automatic packing machines were installed by 1946. By 1947 every available acre of leased land at Geelong was being utilised and a further 200 acres were leased at Altona, adjacent to the west boundary of the Laverton site. In January 1951 another 800 acres were developed at Avalon. During 1957 the private company was converted to public status and Cheetham Salt Limited was formed. Cheetham Saltworks employed a considerable number of people during this period, several hundred men taking care of the three shifts in the factories, with up to 100 extra employees during the harvest period. In the 1920s a hall was built to provide lunchtime and recreational facilities for the staff with the premises used fortnightly for dances. The building also included a library facility. Cheetham Saltworks at Moolap closed operations for a period of time from 1992 to c1996 and the final salt harvest took place in 2009. The continuing maintenance of water levels provides a wetland environment which has become recognised as a bird sanctuary. If there is a conservation policy and plan all works shall be in accordance with it. Note: A Conservation Management Plan or a Heritage Action Plan provides guidance for the management of the heritage values associated with the site. It may not be necessary to obtain a heritage permit for certain works specified in the management plan. Minor Works: Any Minor Works that in the opinion of the Executive Director will not adversely affect the heritage significance of the place may be exempt from the permit requirements of the Heritage Act. A person proposing to undertake minor works may submit a proposal to the Executive Director. If the Executive Director is satisfied that the proposed works will not adversely affect the heritage values of the site, the applicant may be exempted from the requirement to obtain a heritage permit. If an applicant is uncertain whether a heritage permit is required, it is recommended that the permits co-ordinator be contacted. Installation, removal or repair of the following structures where it does not affect buildings and features of primary or contributory significance: fences, storage racks, booths, metal and concrete tanks, pipes, small directional and management signs, fixed process machinery, railings, lights and light poles, electrical and mechanical equipment and housings, conveyors, formed beds for equipment. Maintenance, replacement and installation of plumbing, electrical and fire services where this does not impact on buildings and features of primary or contributory significance.
. Store and Bike Shelter (B9). Demolition of the cream brick southern extension to the Old Mill (identified within B2 on diagram). Internal alterations to all buildings. 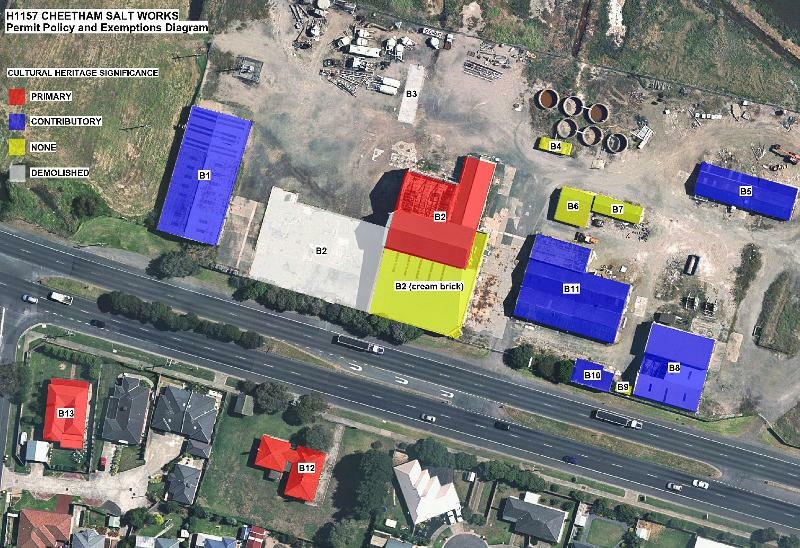 All works to maintain, secure and make safe buildings of no cultural heritage significance B4, B6, B7, B9 and cream brick southern extension to the Old Mill (identified within B2 on diagram). 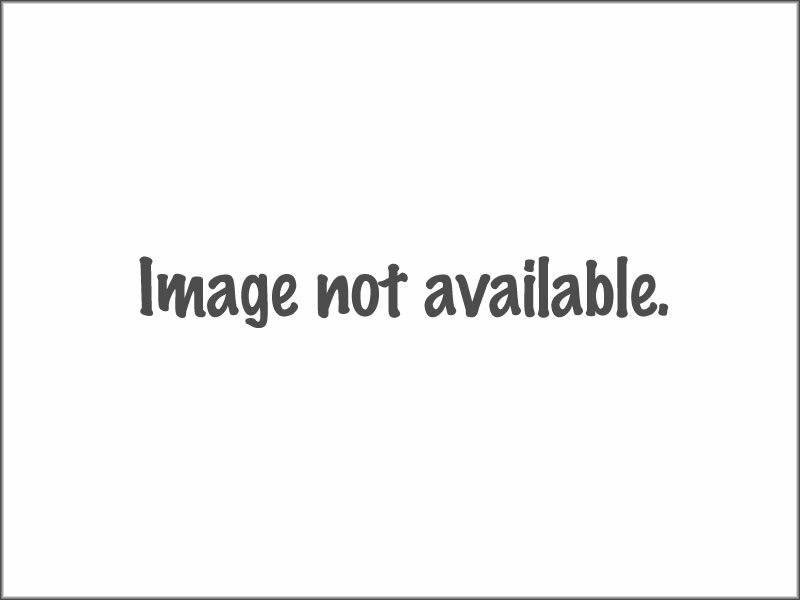 General maintenance of buildings of primary and contributory heritage significance. Such maintenance includes the removal of broken glass, replacement of existing fabric to match original, the temporary shuttering of windows and covering of holes as long as this work is reversible, the removal of asbestos roof and wall cladding accompanied by replacement with colourbonded metal or zincalume. General works/maintenance to fields and pans that does not involve a substantial alteration or modification, providing that the original formation of the pans remains unaltered. General works/maintenance to sea wall and sluice gates that does not involve a substantial alteration or modification, providing that the original formation remains unaltered. Roadworks, earthworks and drainage works provided that it does not involve a substantial alteration or modification to the salt pans, and that the original formation of the pans remains unaltered. d) Archaeological: Ground disturbance may affect the archaeological significance of the place and, subject to the exemptions stated in this document, requires a permit. 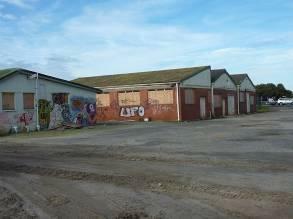 Note: B3 and part of B2 have been demolished since registration of the place in April 1996.